This is my real time Graph, from Mineralab in Prescott, Arizona. You can watch it update once per minute - your browser will automatically refresh. In addition to the graph itself changing over time, you will note updates in both the Counts Per Minute and Time sections. 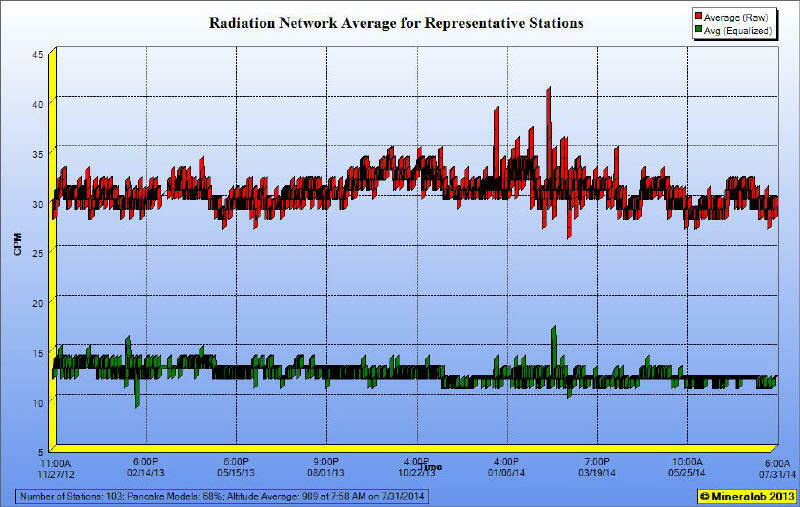 *Readings not Equalized means the Monitoring Stations are broadcasting the raw radiation count from their Geiger counters, without adjustment for different count rates existing between various Geiger counter designs. For instance, models built around a "Pancake" style of Geiger-Mueller tube typically have about a 3 times count rate over Standard tubed models, so their readings in CPM would be expected to average about 3 times higher, anyway.